I never imagined I would be so overcome by the mystery and magic of birds. My body, mind and imagination are being blessed by the standing-still of this…the breath and light and patience of entering into a seldom-noticed world. If I sit/stand still, it is as though a secret world unfolds to me…even comes to me. And I remain still, in awe and in gratitude. The Cormorants are on a migration and have been stopping in to the pond of late. 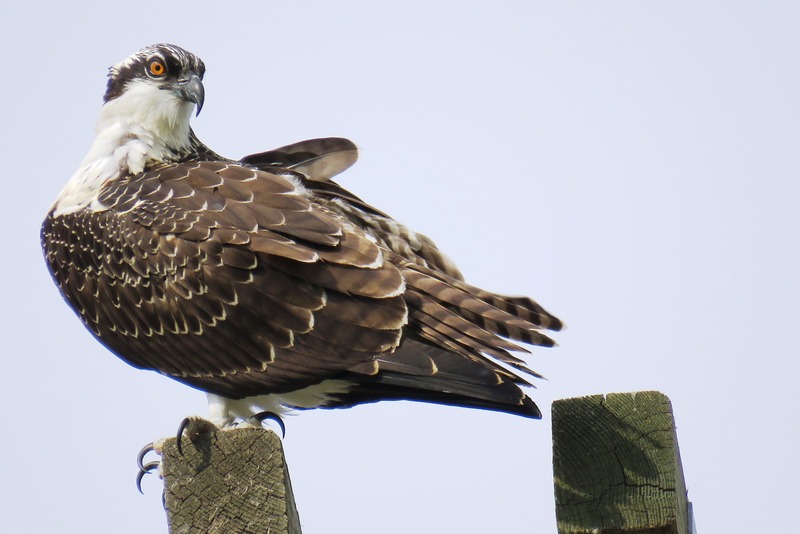 A Great Blue Heron is alternating between this location and over where the Osprey nest is located, just south of 22X. 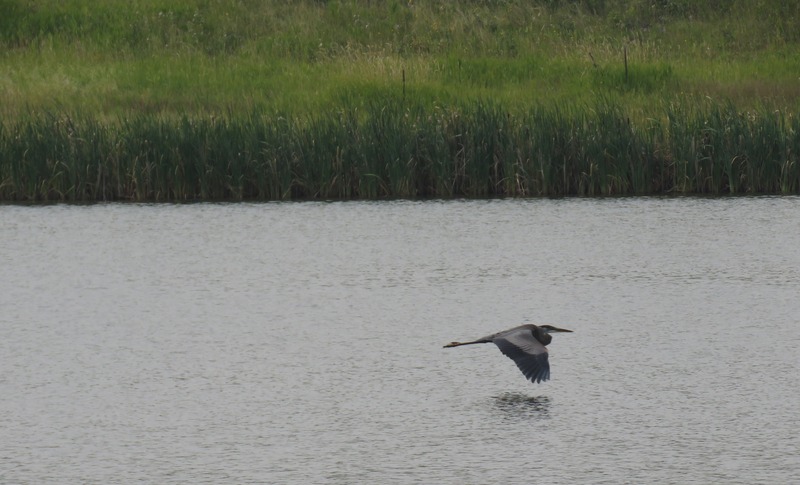 At one time I thought that there were two herons, but recently, have decided that there is just one. The Coots did very well this season and I’ve been watching the juveniles running on the water with their paddle feet, preparing for the next step, flight. I’ve seen, but not been able to archive, yellow finches. 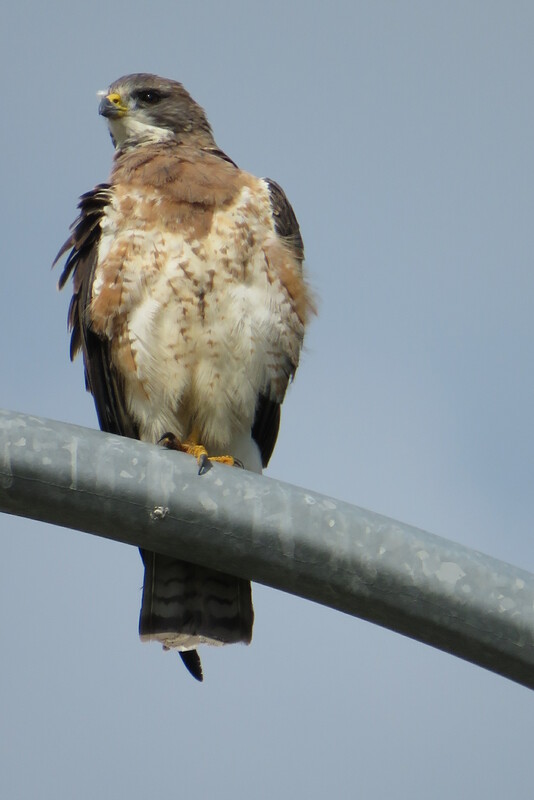 I’ve recently watched adult Hawks sitting on light standards alongside their offspring, teaching them the ins and outs of stalking and hunting down field mice. 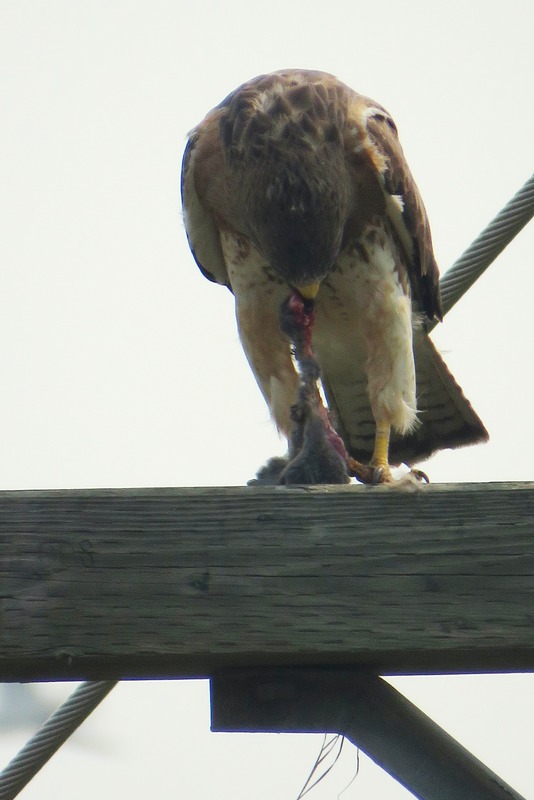 I’ve been intrigued by the hunting techniques and feasting of these raptors. 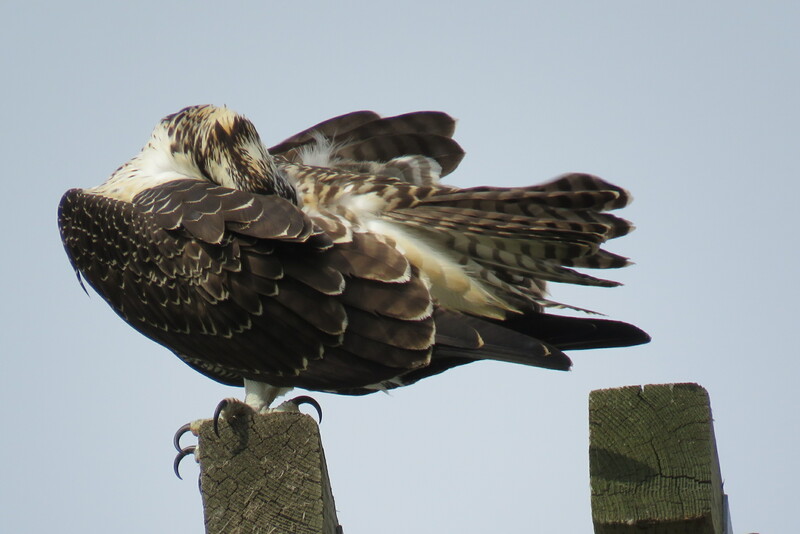 Compare the length of the tail feathers on the adult hawk with those of the juvenile. Today I captured a photo of the youngsters, on its own. 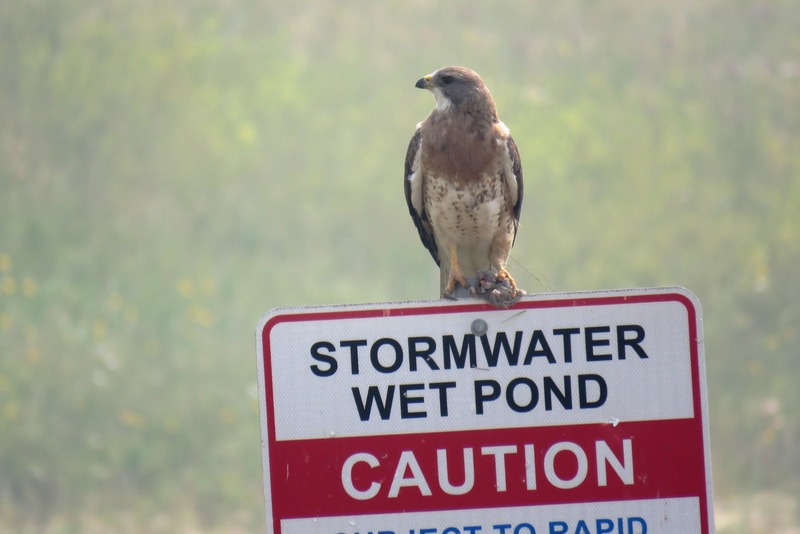 From what I can tell, this is likely a male Marsh Hawk, also known as a Northern Harrier. 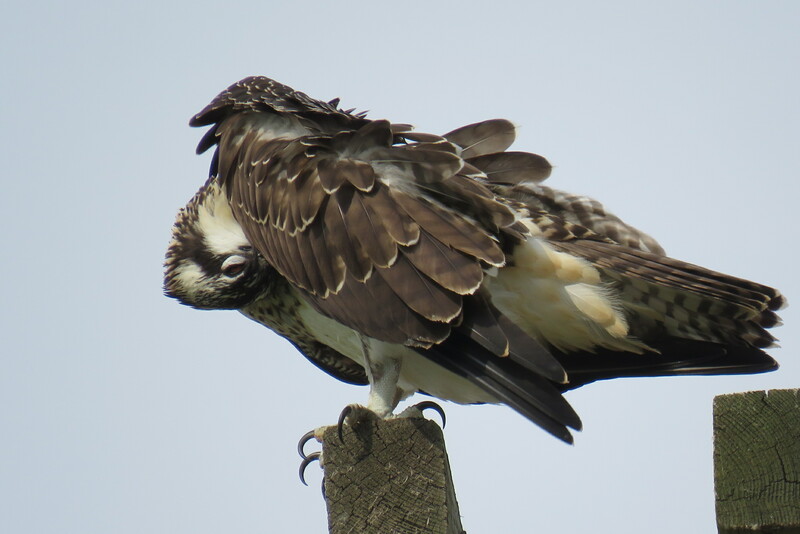 You can tell it’s a juvenile based on its size, length of tail feathers and the maturity of the feathers. 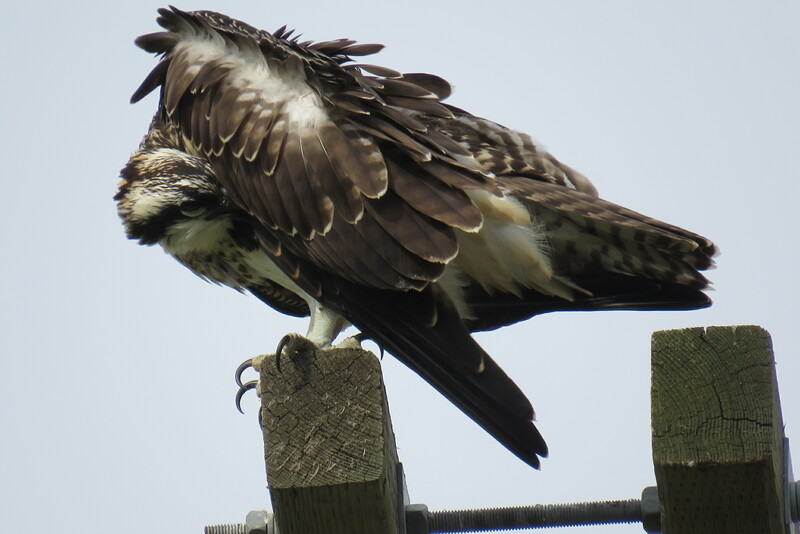 The three juvenile Osprey and one adult have been hunting together from the deadwood and the power poles that edge the pond for the past week and a half. 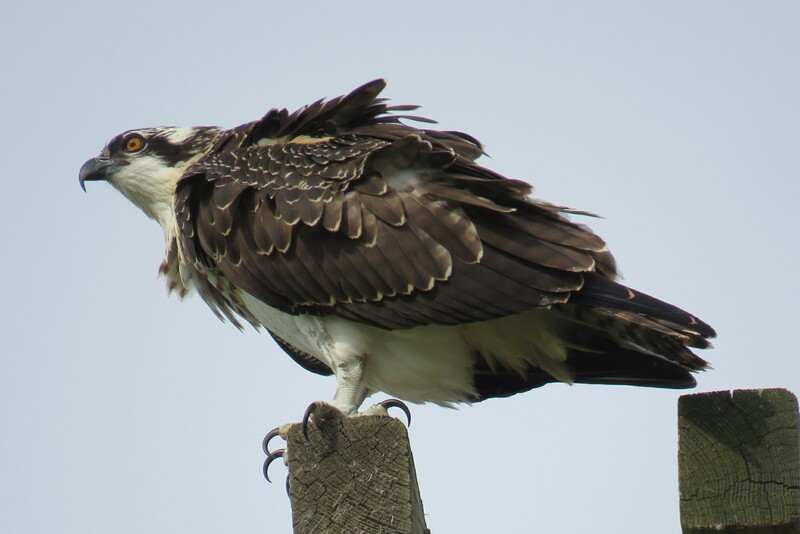 The other adult is most often seen now, closer to the river. 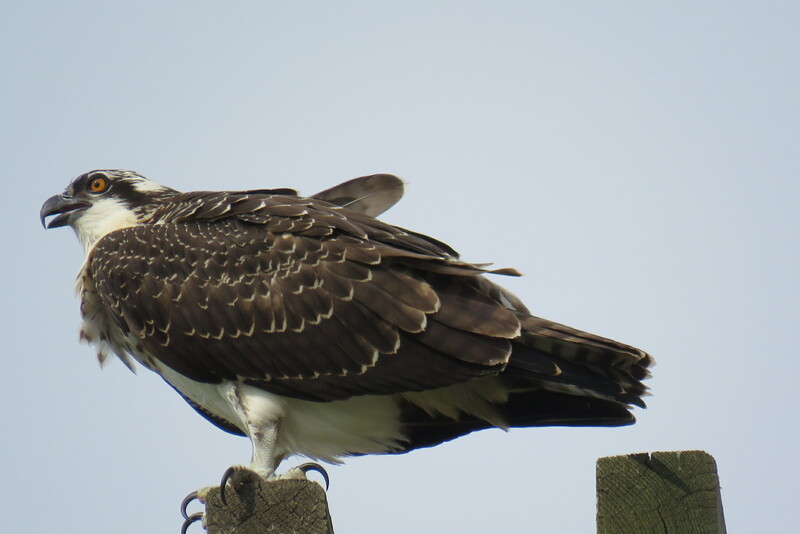 I have not seen any of them at the nest until today. 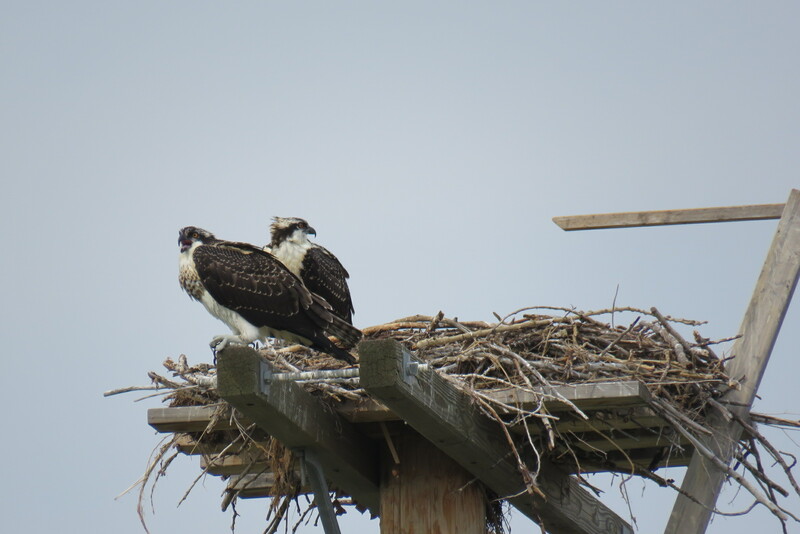 It’s Sunday and I think that as a special treat, a fish was again dropped at the nest because for the first time in quite a while, all three juveniles were in the vicinity of the nest and the adult hung out some distance away. I didn’t stay long because alarm calls were being given by the two birds that were feasting at the nest. 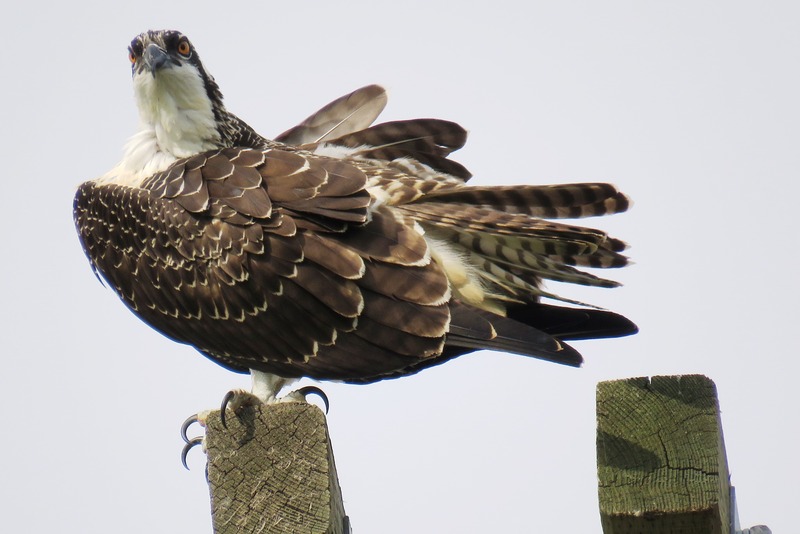 A somewhat obtrusive photographer with a two foot long lens was laying down in the grass above the nest…so, I don’t know if I was the problem or if the other photographer was. My photos are taken from a long way off and as a habit, I never get out of the vehicle. Radio off. Engine off. Silent. Max seems to know the drill also…and even though he is sitting in the driver’s seat, he remains seated and perfectly still. 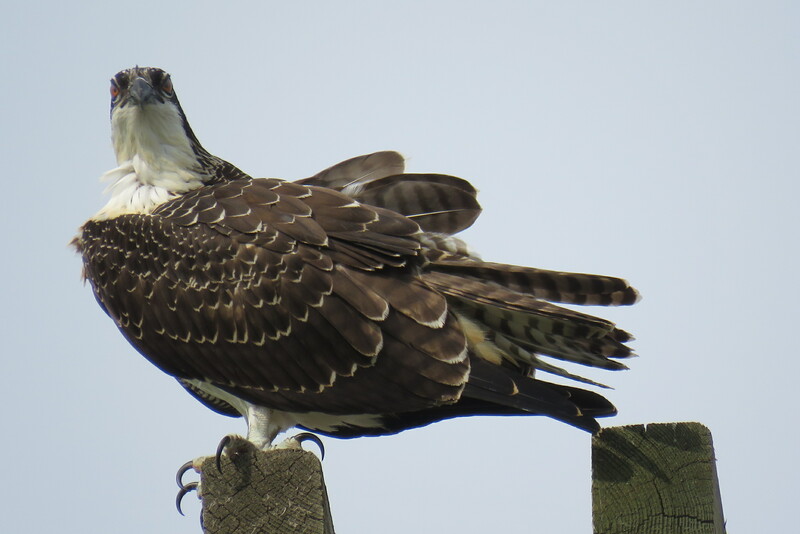 Alarm calls coming from the nest. 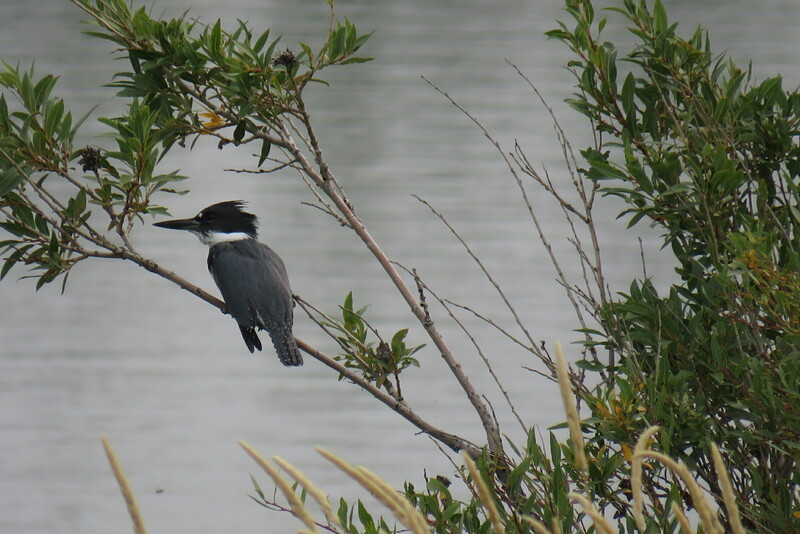 Today, Max was very co operative at the pond when I sited the Belted Kingfisher that I had noticed yesterday. I had no camera with me yesterday, so today, I made certain that my battery was charged. 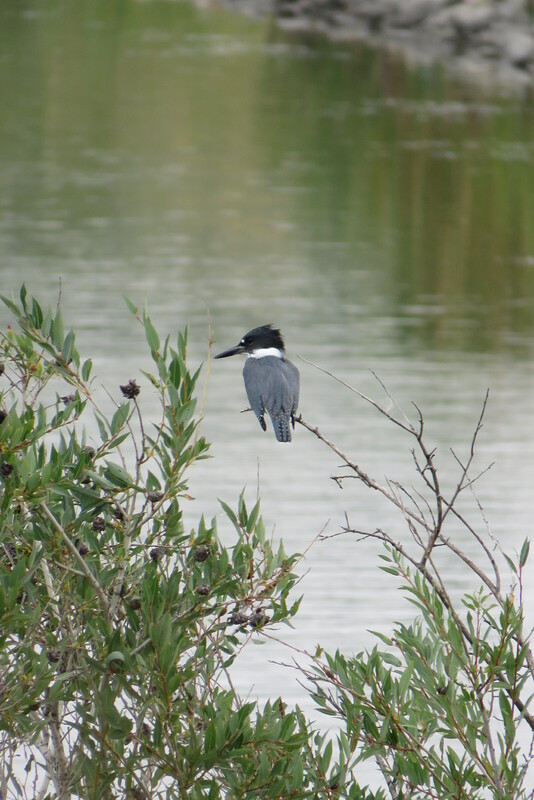 I heard the Kingfisher’s call today and grabbed a few photographs to celebrate my first siting of this species in nature. It was very thrilling. I sat down on the worn path and just watched for the longest time, Max on leash and tied to my waist so as not to disturb the moment. 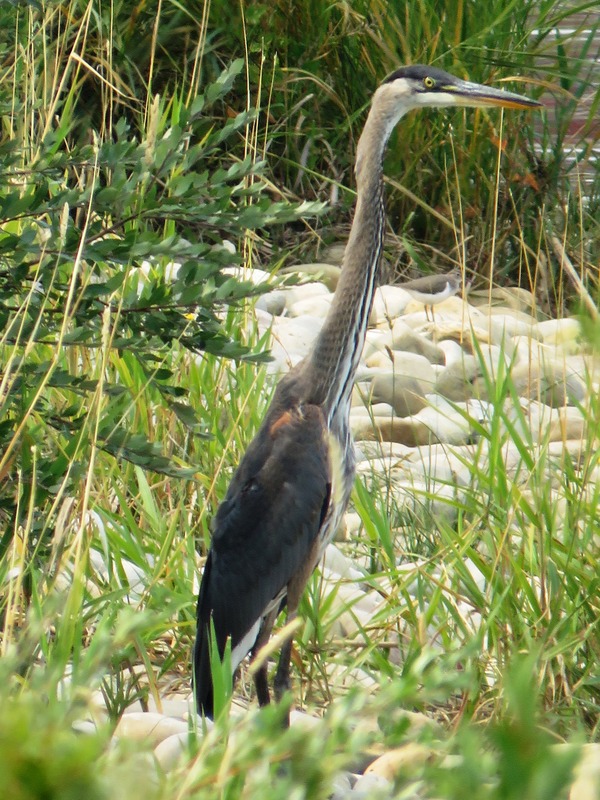 The Great Blue Heron, while elusive, has been a constant companion at the pond for two weeks. Continually relocating as I travel the circumference of the pond, I have seen it fly and watched it feed at the shore. It’s been heavenly.